Hey Folks! How are you today? I bet some of you are pretty excited because it's Friday! I was just thinking that Mother's Day isn't very far off. I haven't shared all of my Display Stamper samples with you yet and it just seemed like the perfect time to share this box. 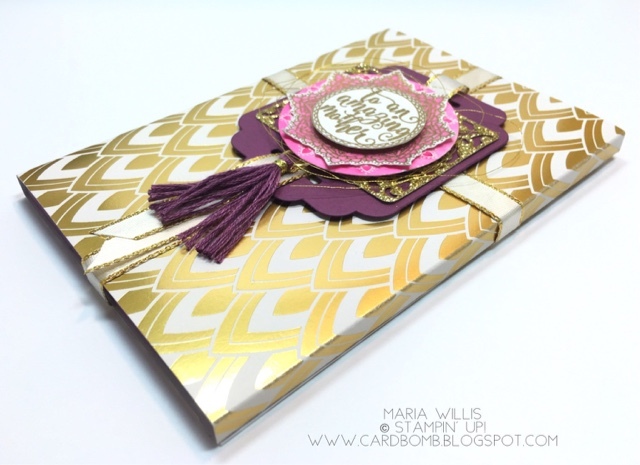 I started off with this beautiful golden paper from the Eastern Palace DSP pack. It is seriously so beautiful! Then I paired it with new ribbon. Check out the gold trim on this silky ribbon-it is so fancy! Then I decided to throw in some new In Colors and a new embellishment! I started by stamping this gorgeous sentiment from Everyday Tags (Occasions Catalog) three times in versa mark ink on watercolor paper. I heat embossed it twice in gold and once in clear embossing powder. I punched the first and third layers out and fussy cut the middle layer. Then I used the new Berry Burst to watercolor the middle and back layers. I also added a little Flirty Flamingo but not much. One of the ways I decide if I like a color or not is based on how it watercolors. Do you ever watercolor and watch to see what a color is made of? Do watercolor in a green and get excited when it separates into hues of blues and greens... what about when it has an element of yellow? Anyways, these are the things that get me all excited when I'm late at night and alone in my craft room. Guess what?! Berry Burst got me ALL excited! If you haven't watercolored with it yet, please do. It stamps in a dark, rich hue but when watercolored it goes all kinds of gorgeous vibrant on you. It is seriously amazing and not at all what I expected when I first saw the ink and paper. After watercoloring in a variety of Berry Burst hues I layered my sentiment pieces over gold glimmer paper and a Fresh Fig tag with loops of Gold Metallic Thread in between. I finished my box off by adding one of the new tassels in Fresh Fig and it really gave the box a fancy, polished look. Have you all made your Mother's Day cards yet? I just had someone commission eight cards and another person wants a few more "unconventional" cards. I wonder what I will come up with... better get started. And with that, I am off! I'll see you back here soon and thanks for stopping by!